Registration is short and will be completed on the next page. 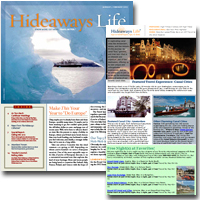 Register and you'll also start receiving bi-monthly FREE travel e-newsletters and partial access to Hideaways.com. Plus, you'll get notifications of special offers, deals, and interesting insights on the best travel destinations around the world.